Don’t let the red color of this traditional Malaysian dish dish intimidate you if you aren’t a fan of spicy food. 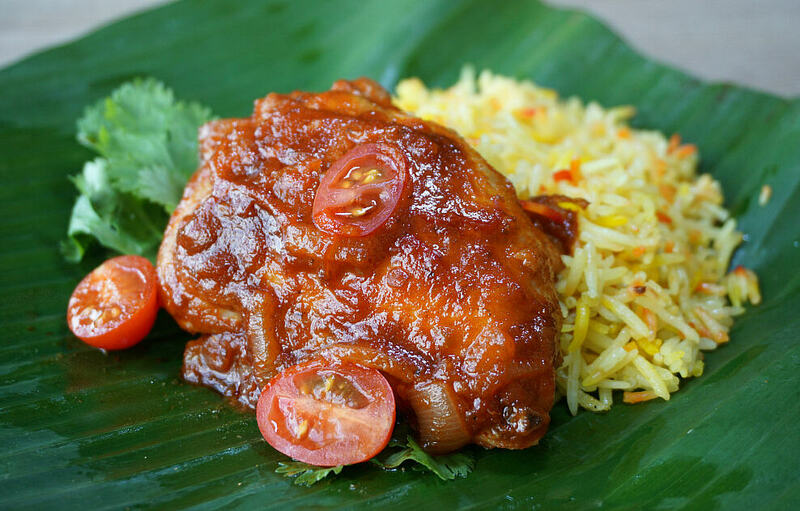 Some Malaysian dishes do have quite a bit of heat, but this dish (which translates from Malay to ¨Red Cooked Chicken”) gets most of its deep red color from tomatoes. The dish is often served at weddings, accompanied by Nasi Tomato (Tomato Rice). There are a few spicy red peppers to give a hint of heat. Those spicy peppers are joined with other common ingredients used in Malaysian cooking, such as turmeric, galangal (ginger), lemongrass and garlic. The complex dish includes a little sweetness from sugar and cinnamon, all simmered together in a rich tomato and coconut milk gravy. 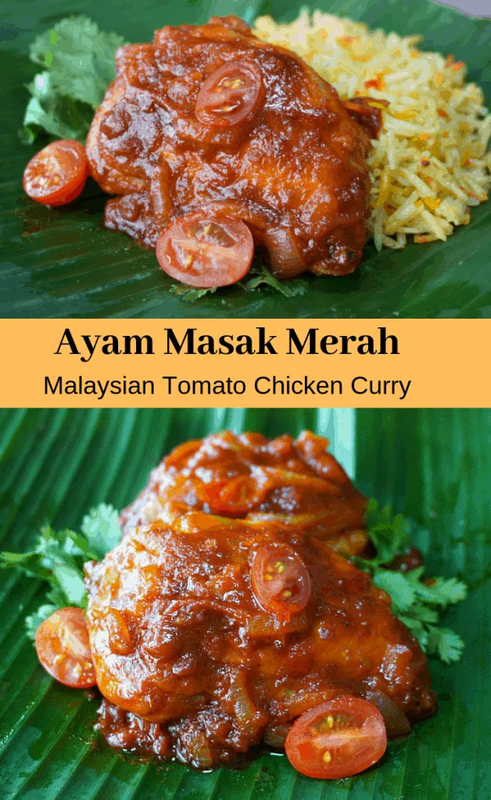 While the ingredient list sounds a little challenging, making Ayam Masak Merah is actually pretty easy. The dish starts with making crispy fried chicken which is finished in a curry tomato sauce. The complex flavors of this dish are perfectly balanced and not overwhelmed by heat, making it a crowd favorite and a great introduction to the famous dishes of Malaysia. After tasting Ayam Merak Merah, it won’t be hard to understand why many dishes in Malaysian cuisine, such as Chicken Rendang and Laksa, are often voted some of the most flavorful in the world. Rub the chicken with the turmeric powder and salt. Place in the refrigerator in a covered bowl for 1 hour. Add oil to a pan and heat to medium. There should be about an inch of oil in the bottom of the pan, so the amount you use will depend on the pan selected. Brown the chicken on all sides (about 15 minutes). Cook the chicken in small batches if necessary to avoid overcrowding in the pan. The chicken should be about 3/4 cooked but not completely cooked through. When the oil is cool reserve 2 Tablespoons and discard the remainder. Add the shallots, garlic, turmeric, ginger, lemongrass, cinnamon, 1 Kaffir lime leaf and chilis to a blender. Blend until smooth. Add a small amount of water or vegetable oil if more liquid if needed to blend. No more should be used then necessary to cover the ingredients. Add star anise, cloves and onion to the pan with the reserved oil over medium heat. Saute for 5 minutes. Add the blended spice mixture to the pan and cook for about 5 minutes, when the spices become aromatic. Add 1/2 of the diced tomatoes, tomato paste and sugar. Continue to saute over medium heat for 10 minutes. Add the chicken allow the sauce to return to a low simmer. Continue to cook for 5 minutes, stirring occasionally and adding water in small quantities if the mixture becomes too thick. Add the coconut milk and 2 kaffir lime leaves (lightly crushed in your palm to release the flavor, and the remainder of the tomatoes. Continue to simmer for 5 minutes. Remove the clove, star anise, and Kaffir lime leaves before serving. Divide into bowls and garnish with julienned kaffir lime, fresh tomato and fresh cilantro. Serve with rice (preferably Nasi Rice) and sambal sauce on the side (optional). 3 Roma tomatoes or 2 medium round tomatoes can be substituted for the cherry or grape tomatoes. If fresh chilis are not available, it is fine to use dehydrated. Just cover them in boiling water and allow them to rehydrate for 10 minutes before adding. In order to reduce heat in the recipe, remove the seeds and membrane of each pepper. Each Kaffir lime can be substituted with 1 teaspoon of fresh lime zest.